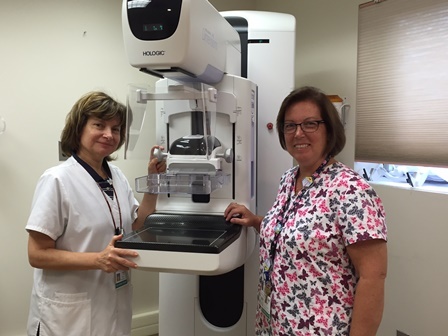 Accurate, high-quality imaging is fundamental to proper diagnosis and breast care. That’s why The Center for Breast Health has its own imaging division, devoted entirely to our patients, in one convenient location. Our imaging facility is staffed with technologists who have extensive clinical expertise and training in breast diagnostics and imaging. That makes a difference, because they understand the unique needs of women. It’s their sole specialty, day in and day out, and it shows. Screening and diagnostic mammography – Performed by a certified technologist, and interpreted by a radiologist specializing in breast imaging. Focal breast sonography – Also known as ultrasound, this technology uses sound waves to further evaluate abnormalities. Fine needle aspiration – For this procedure, a radiologist uses a very thin needle to remove a small amount of fluid or tissue for analysis. Stereotactic breast biopsy – This is a minimally invasive procedure that uses local anesthesia. A radiologist uses mammographic X-rays to find the precise location of abnormal tissue. He or she then takes a small sample of the tissue for analysis. Core breast biopsy – A minimally invasive procedure done under local anesthesia, a radiologist uses ultrasound guidance to find and sample the suspicious area. 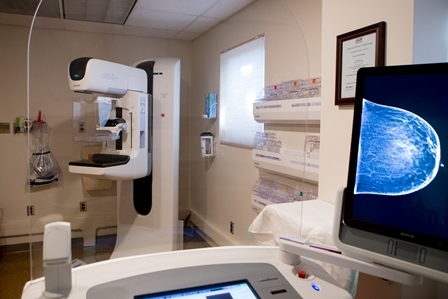 Our imaging center offers the latest in breast cancer imaging detection technology, 3D mammography. 3D mammography, also known as tomosynthesis, is used in conjunction with 2D digital mammography. 3D mammography produces three dimensional images of the breast from multiple angles using a small rotating digital scanner. Radiologists and technicians can move and enlarge the images to view any area of concern. A 3D mammography procedure examines breast tissue layer by layer, enabling higher visibility and clarity than a flat view. Precise, earlier breast-cancer detection finds 20 percent to 65 percent more invasive breast cancers than two-dimensional mammography alone. For all of these procedures, a nurse will be present to guide you and explain the medical aspects of these tests. In addition, our clinical nurse navigator is available to help you through the process and answer any questions you may have along the way.